=AE= Battlegems Founder leaving soon! All Forums >> [Artix Entertainment Games] >> [AdventureQuest] >> AdventureQuest General Discussion >> AQ Design Notes >> =AE= Battlegems Founder leaving soon! 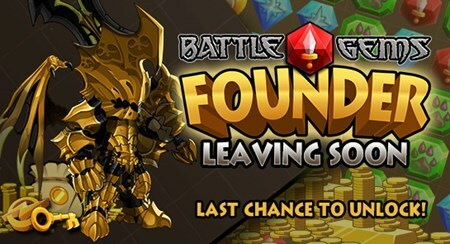 This is your very last chance to get Founder in BattleGems, our mobile RPG Puzzle Game. Considering that you had.. oh wow, nearly two years now, it is finally time to make BattleGems Founder go perma rare! Rolith and his team have upgraded BattleGems to the newest version of Unity improving the game's speed and giving it 64 bit support. Along with this release, we will be removing the Founder package which basically gives you ulimited turns, unlimited keys, special in game armor set, special AQWorlds armor set, well... EVERYTHING for a single in-app purchase of $10. Founders will be pretty proud of that they got it, because after the new patch goes live, the armor will be perma rare and will have to pay double to get the upgrades and perks. So if you have been wanting the DragonKnight armor from BattleGems in AQWorlds and BattleGems... this is your final chance to get it on the Apple iOS or Android versions of the mobile game!